Spelman College’s Board of Trustees has agreed to honor Dr. Beverly Daniel Tatum with the title of president emerita once she steps down. 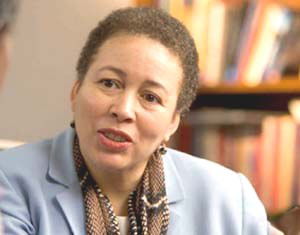 After serving for more than a decade as president of the all-female historically Black college, Dr. Beverly Daniel Tatum has announced that she will retire from Spelman College next year. The end of an ambitious 10-year fundraising campaign that yielded $157.8 million for the school and the celebration of her 60th birthday in September were the two factors that Tatum said led her to decide that it was time for her to move on next year. In recognition of her years of service, the Board of Trustees has agreed to honor her with the title of president emerita once she steps down. “I have a desire to really work on a book,” she said, adding that her retirement will include updating her 1997 book Why Are All the Black Kids Sitting Together in the Cafeteria, a popular text still widely read and used in college courses across the country. “I have been surprised that 17 years after publication, the book is still as relevant for people as it has been and I want to update it and think about race relations in the Obama era,” said Tatum. The former psychology professor, who has held administrative positions as department chair, dean and acting president of Mount Holyoke College before she arrived at Spelman in 2002, has been lauded as a stabilizing force for the Atlanta-based institution. During her tenure, she has increased alumni giving and launched Wellness Revolution, an initiative aimed at keeping Spelman students healthy and fit. Amanda Washington, who graduated from Spelman in 2009, said that Tatum was “visible, active on campus and very supportive” of the female students on campus. “She feels like a fixture,” said Washington, who said that while it’s normal and natural for her to want to step down at this juncture in her life, the news of her retirement is still sad. Tatum’s departure does mean that the Atlanta University Center — which includes Spelman, Morehouse and Clark Atlanta University — will lose two presidents next year. In April, Clark Atlanta’s president, Dr. Carlton E. Brown, announced that he was also retiring next June after six years on the job.